Dry air means that static electricity has the chance to flourish. If you’re walking through your home and you’re constantly getting zapped when you touch doorknobs and handles it’s because you’re air desperately needs moisture. Another symptom of dry winter air is dehydrated hair, skin, and nails. When your winter air dries out then your body dries out too. If you’re suffering from especially straw-like hair, dry skin, and brittle nails don’t chalk it up completely to winter, the negative conditions of your home can really impact this too. Is the wooden furniture in your home cracking or chipping? This is also because your home is so dry. We can’t emphasize this enough—when the air in your home is dry, everything in it (including you) also dries out. If you’d like to keep your wooden furnishing pristine it’s a great idea to balance the humidity levels in your home. 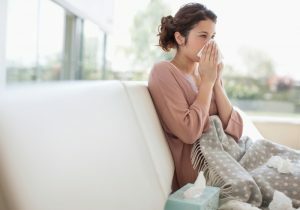 Coughing, wheezing, and sneezing all winter long? This is likely because of a combination of increased dust and debris in your home, dry conditions, or a combination of the two. The best action to take in this circumstance is installing a humidifier. Don’t run down to the store and buy a small humidifier that people use for cold and flu season either. There’s no point in conditioning the air in only one section of your home—you need a whole-home humidifier in your home. Here in Texas we normally think of humidity as a bad thing because of our hot, wet summer conditions, but humidity is a great ally to have in your home during winter. Dry and contaminated winter air is easily combatted by a humidification system. If you notice that you suffer from all the problems above then contact our team to learn more about humidifiers. We can match your home with the right humidification system here in San Antonio. If you’re struggling with your indoor air quality then contact Cowboys Air Conditioning & Heating.